This model is no longer available. (As of 12/1/2018). Check out the latest Motorized Skateboard comparison article for more options! When researching your next purchase of a motorized electric skateboard, several big names are sure to pop up. Along with those big names are some big price tags. One name that might not pop up in your Google search is the HAITRAL Motorized Electric Skateboard. Well, simply because this little gem is overlooked by the skateboarding community. While not a high performance board, this one still has some great features. In this reviewer’s opinion, it has just been overlooked. 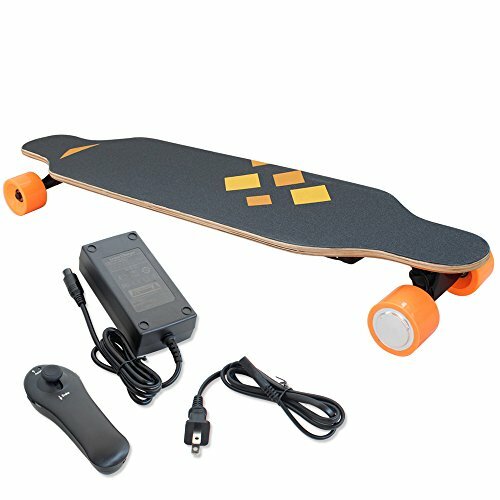 The HAITRAL Motorized Electric Skateboard is comparable to others in terms of construction and size. 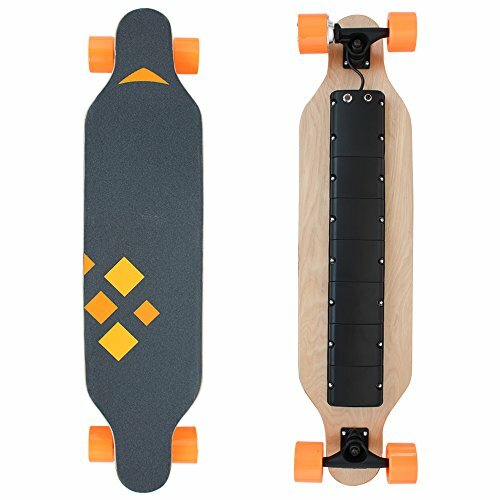 At 37.5 inches long, its size is on par with most other electric long boards. Its deck is a nice width at 9 inches, giving you plenty of foot room. Its 9 layer maple deck is actually more rigid and sturdy than some more well-known brands who offer only 7 layers. The HAITRAL deck surface is covered with a sandpaper like, skid proof covering decorated with orange graphics to break up the color. An arrow printed on the front points you in the right direction to travel. This board weighs just 11.5 pounds, compared to 16 pounds or more which some boards weigh. It features a wheel driven hub motor that provides power of 150 W, from detachable and rechargeable battery packs. Inside its battery packs are 18650 lithium ion batteries, which require 2 hours to fully charge. Mounted inside plastic boxes attached on underside of the deck, these power packs allow the HAITRAL board to travel at up to 15.5 mph for a range of up to 13 miles, on flat terrain and depending on rider’s weight. According to the manufacturer, 200 pounds is the maximum weight for a rider. The manufacturer also claims that this board can easily climb a 25-35 degree hill. This reviewer did not have an opportunity to test that claim. 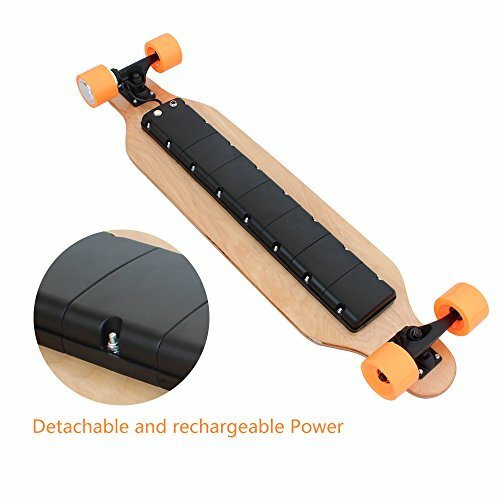 The HAITRAL Motorized Electric Skateboard comes in at one of the lowest prices. This makes it an excellent entry level board. The downside to this board is its difficulty to use. Several riders have complained about how hard it is to power on and operate, as there are a series of rules you must follow. You will have to read directions for this one. The manufacturer instructs the user to press a button, listen to some beeps, then press and hold the button. This board has an excellent entry level price tag! 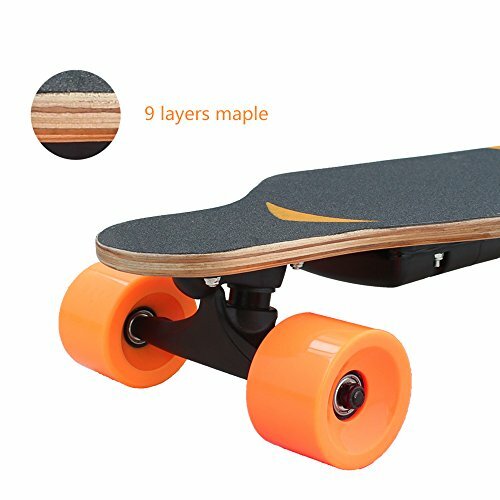 It’s a fantastic beginner board to assess your interest in motorized skateboarding. The 9 layer maple hardwood deck is stronger than most of others. At just 11.5 pounds, this board is lightweight. Its handheld, wireless remote-control is compact and easy to use. The board can travel up to 15.5 mph, a respectable speed for an entry level board. With just 150 watts of power, this board doesn’t have the torque that others have. Recharge time is long, and the manufacturer insists you must have a full charge before riding to avoid motor damage. The maximum allowable weight for a rider is roughly 200 pounds, so larger adults might not be able to ride. 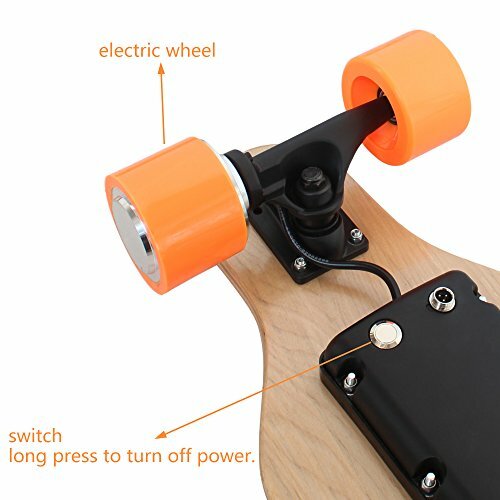 The wheel hub motor could quickly wear out, if this board is used excessively, like for a daily commute to and from work. The biggest weakness is difficulty in operating this board. Pressing and holding buttons until you hear a certain number of beeps, then pressing and holding again until you hear different beeps could be tiresome. 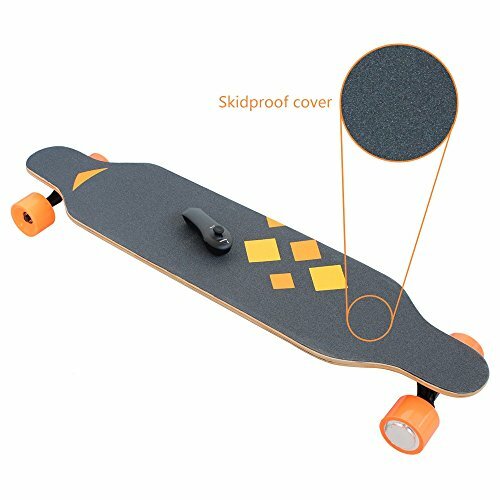 This board would be great for a novice wanting to check out the electric skateboard fad. For a commuter or serious rider, there are other boards that offer better performance and durability at reasonable prices.